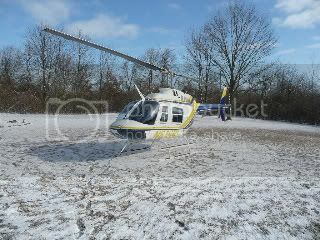 Practice got underway shortly after 8 am and at about 9:30, the sound of Scott's blades pounded the ground as he and Ross arrived by helicopter and landed just about a stones throw from the entrance. We began the races right on schedule at 11am and it was very close racing all the way. The track is quite fast and very fun to drive. It seemed that there were many more side-by-side battles that lasted for many laps throughout the day than I have seen before. Before I get to results, I want to thank our 2011-2012 league sponsors for their support. 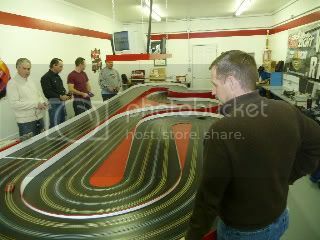 Thanks to Difalco Design, SCX Worldwide, CincySlots, BRS Hobbies, Hot Slots 132, and Slot Car Corner. 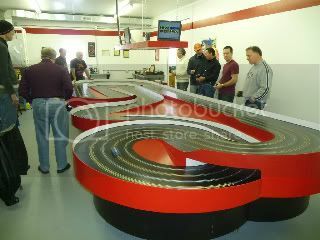 Slot Car Corner recognizes the special efforts of two league members at this round. Congratulations to Butch Dunaway and Eric Roberson and thank you for setting the example for good sportsmanship. Difalco Design had a Genesis HD30 in the battle once again. The more that try it, the more that like it. Thanks Jim! And SCX, CincySlots, and BRS Hobbies each provided a car for our event. The lucky racers to receive these cars were Andy, Eric, and Jeff. Thanks Chuck, Bruce and Brian for the great service and products!!! These are the numbers through all lanes 5 minutes each. Thanks Butch!!! It was a great day!